I know I am lucky – but I temper that thought with the knowledge that I am the one that works the garden. It’s just me, mother nature and the magical sprites and fairies that populate the garden for good or bad depending on their mood. 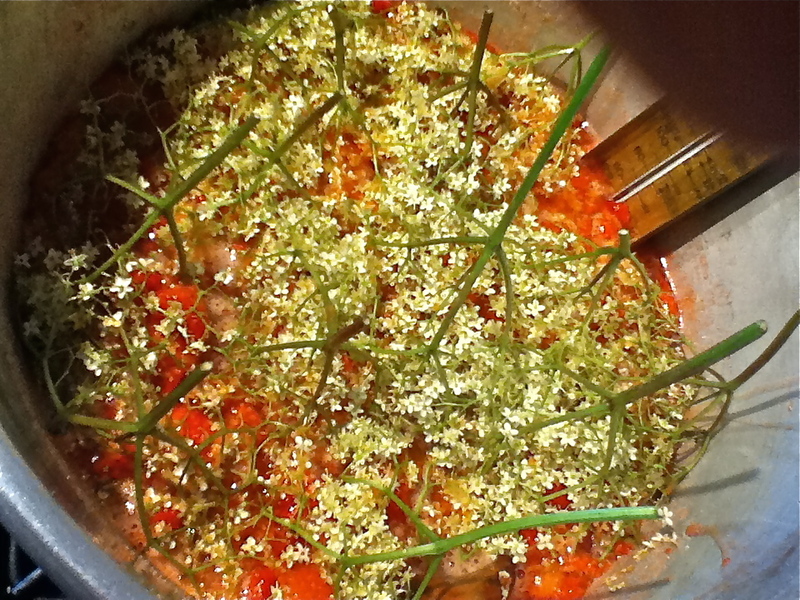 All the fruit and elderflowers are from my garden. 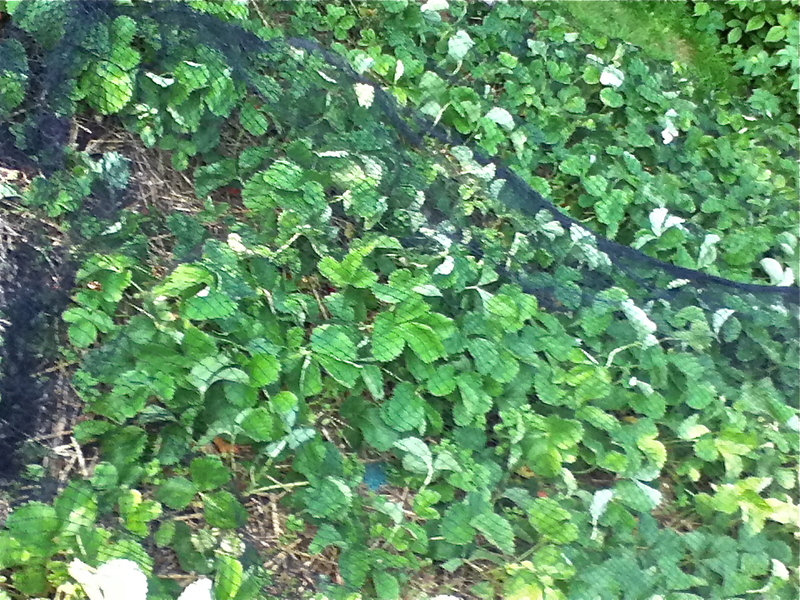 I am a bit fussy about my strawberries. 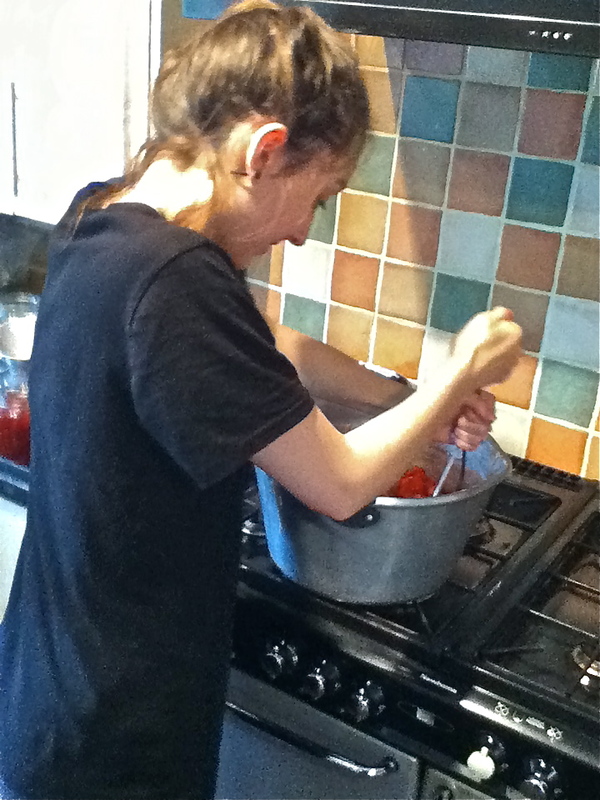 This time I had my lovely Daughter No1 to help me – I’m hoping the love of ‘jamming’ has found it’s way into her soul too. This is the BEST jam you can have. Quintessentially British and the flavour is outstanding. It is essential that you do not cook this any further than stated as you will get a firm set and then all the nuances of fresh strawberries will be lost. That sort of jam can be bought at any supermarket for 40 p a jar. 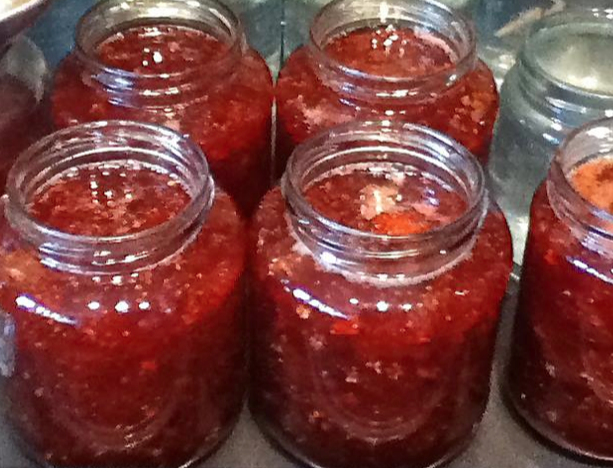 This is something very special -easy to make and will set you on the path of ‘getting’ why it is you would want to make your own jams and chutneys. I make this in my jam pan, if you only have a 4 litre (pasta) pan then halve the amounts. 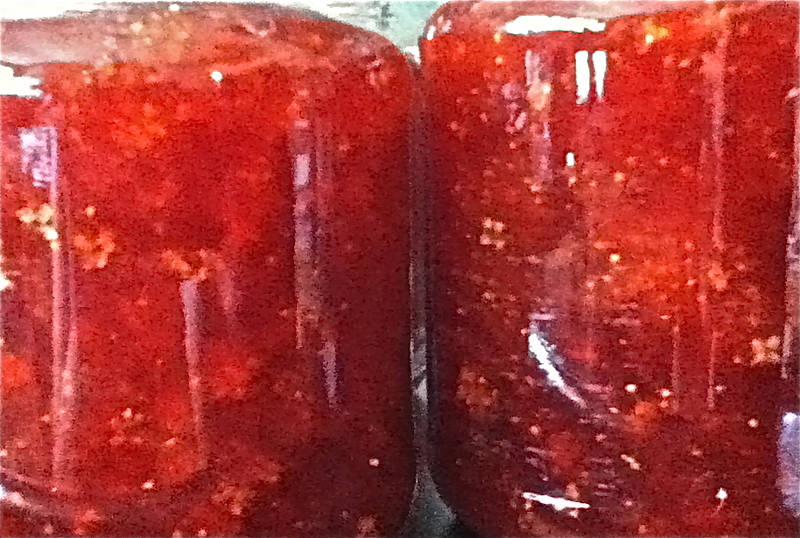 You will need about 10 1lb/480g glass jars. 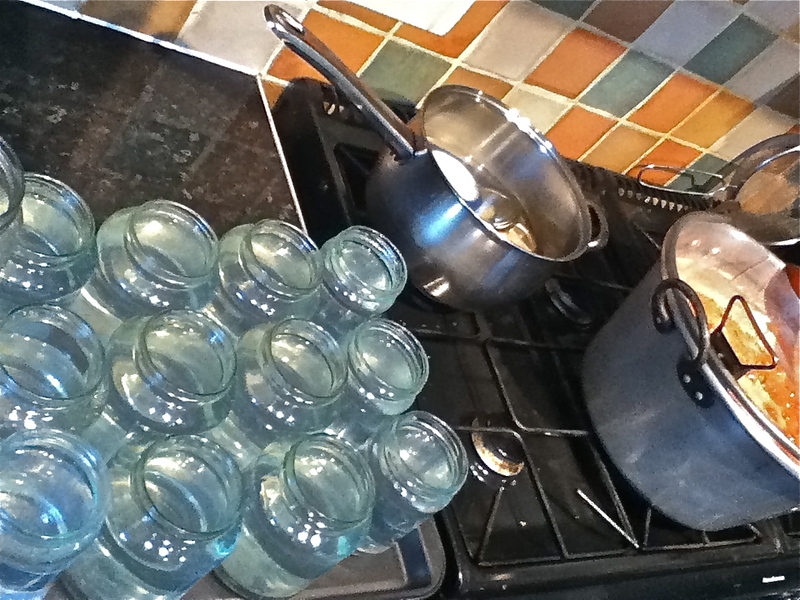 I sterilise my jars by standing them onto a large tray and filling them to the brim with boiling water (be careful if you do this because the jars can crack – although I have NEVER had a jar crack). Once the water is boiling pour the water into the jar to fill only 1/6th of the way full – this will allow the glass to begin to temper and you should not have any problems. Allow the jar to stand for 5 minutes and then reboil the kettle and fill the jar with the boiling water. Pop the lids into a pan of boiling water and allow to simmer away until you need them – don’t do this with plastic lids – they will need to be sterilised in a baby bottle fluid like Milton. *If the jar has a flaw or is cracked it will now shatter – but it would shatter anyway once in the oven or when you have added the hot jam. Best to get it over with whilst it only contains a little hot water on the side where you can see where the glass has gone! Pop the fruit into the pan and crush lightly with a fork, a masher, the end of a rolling pin or your hand – just to the the juices flowing. Add the sugar and stir. Add the bag of apple cores at this point if you are using them. Turn the heat onto very low and allow the sugar to dissolve (maybe 5 minutes). You will know when it is dissolved as it will not sound scratchy when you stir it. 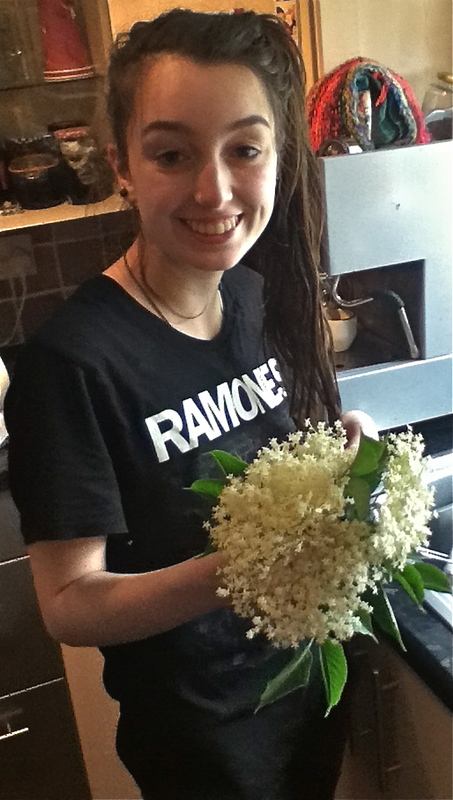 Add the lemon juice and elderflower heads. Turn the heat up and pop in the thermometer (if you are using one). Bring to a rapid boil for about 20 minutes (or until it reaches 130˚C). 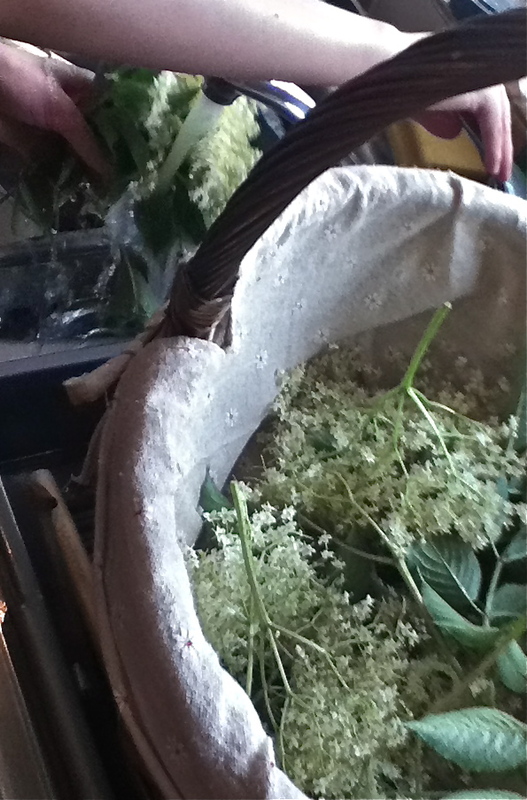 Turn off the heat and remove the elderflower heads (and apples cores if you have used them). Give it a good stir and use a ladle to carefully remove any remaining foam. (Most will disappear once you have stirred it). 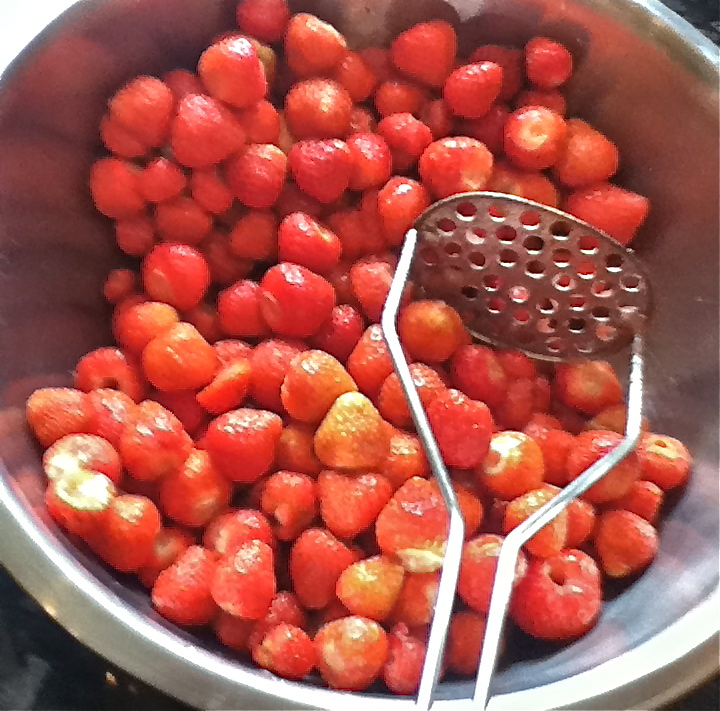 Add in the pectin and stir. Empty the jars of the now tepid water. Fill with the hot jam. While still not pop on the lid and turn to just seal. Posted in Autumn, Cake, Chutneys/Jams/Preserves, cooking, Dairy Free, Dinner, Egg Free, food, Gluten & Wheat Free, Lunch, No Added FAt, Pudding, Side dish, Soya Free, Summer, Superfoods, Supper, Tea/Snack, Uncategorized, Vegan, Vegetarian, Winter. I am a little limited with what I can post as I don’t have any sort of camera – they were all in the bag! So it’s a fine excuse to give you this recipe. Absolutely one of my favourites. Never is anything like the stuff you buy when you are out and about and you will want more than the one slice – for sure! Parchment paper line or grease and flour a 20 cm cake tin. Rub the butter into flour. Beat together the egg and milk mixture. Then stir together the eggs mix into all the dry ingredients. Bake at for 50-60 minutes. You may need to cover it with a piece of paper for the last 10 minutes if it looks like it is getting too brown. Allow to cool for 5 minutes before lifting from the tin. Spread the coconut onto a baking sheet and pop into the oven for maybe 5 minutes (depends how old and dry it is). Stay by the oven as when it starts to brown it will turn quickly. As soon as you smell it, check it and if it is just turning golden remove it from the oven. Spread the top with the raspberry conserve and sprinkle with the coconut. This cake improves with keeping over a period of 2-5 days. I do sometimes miss that last very important step and we get to eat it warm and fragrant and so delicious. First to say, it is so cold in this kitchen on this typical November morning of bright blue skies and frost that I am wearing my gloves as I make my first pot of tea. Okay, that said, today will be the day for another batch of Conference Pear Chutney. 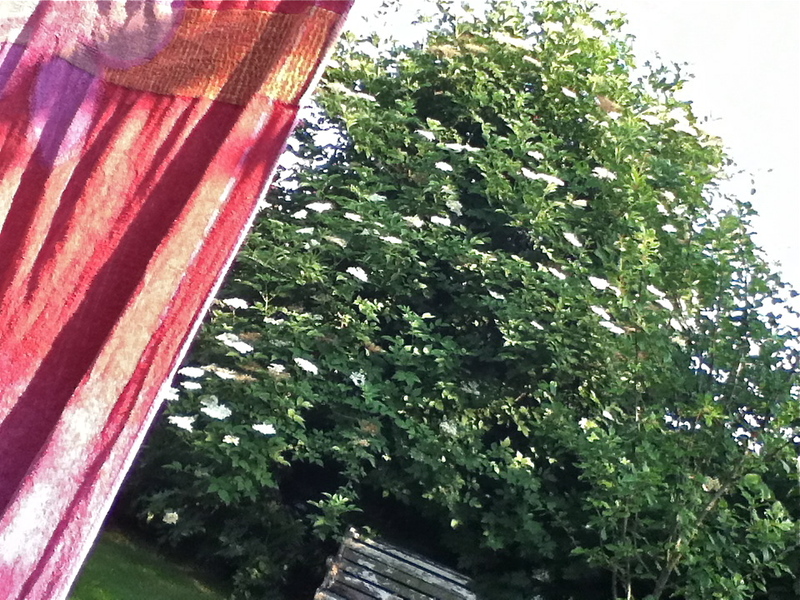 I am very lucky that the tree in the garden consistently provides me with a very generous supply every year, and they are my favourite. I have a love of preserving that is entirely down to my Mum and Dad. 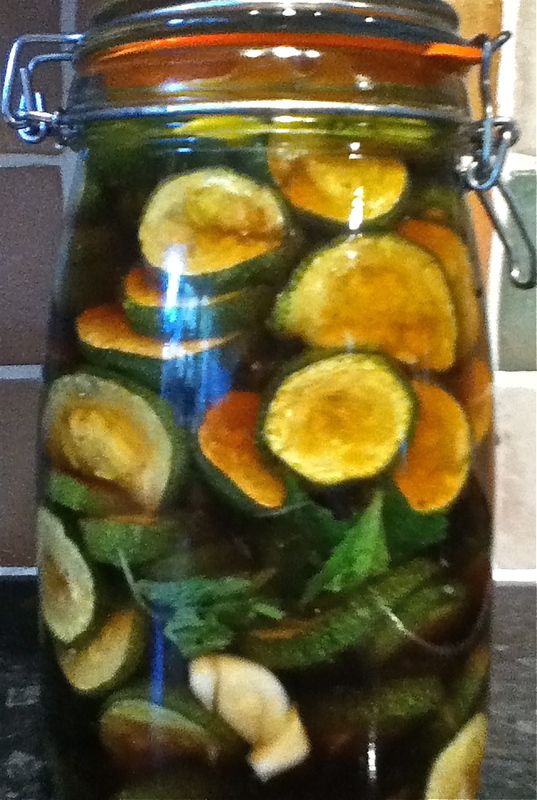 As Southern Italian farmers it is in their DNA (and so mine) that any excess be preserved. I can remember being very small, maybe 3 years old sitting at the kitchen table with my Mamma feeding tomatoes into long necked glass bottles (with the essential leaf of basil,) that she would then take outside to a massive vat of boiling water to be cooked for several hours. And then playing in the garden around the fire only to jump out of my skin at the occasional bang as one bottle would have a little air trapped in it and so explode. This way we would have tomatoes for sauce in the winter. My first attempts at any thing like this was when I was about 11 years old and I made my first batches of Marmalade from the local markets end of the day sell off. A long way from the stuff bought in jars from the High Street’s International Supermarket, but far nicer and I was hooked. Every year I make a variety of preserves and I hope to hand the love of it down to my daughters. Anyway, this is my basic recipe, I encourage you to add and subtract ingredients as fits your palette, but have in mind that if you remove an ingredient, lets say the ginger, you may want to add another ingredient, perhaps another spice, so that the chutney will still have a good balance. You will need to sterilize some jars so I am putting this before the recipe so you will have read it before you get all over keen and start chutney-ing-up what you have in the fruit bowl. 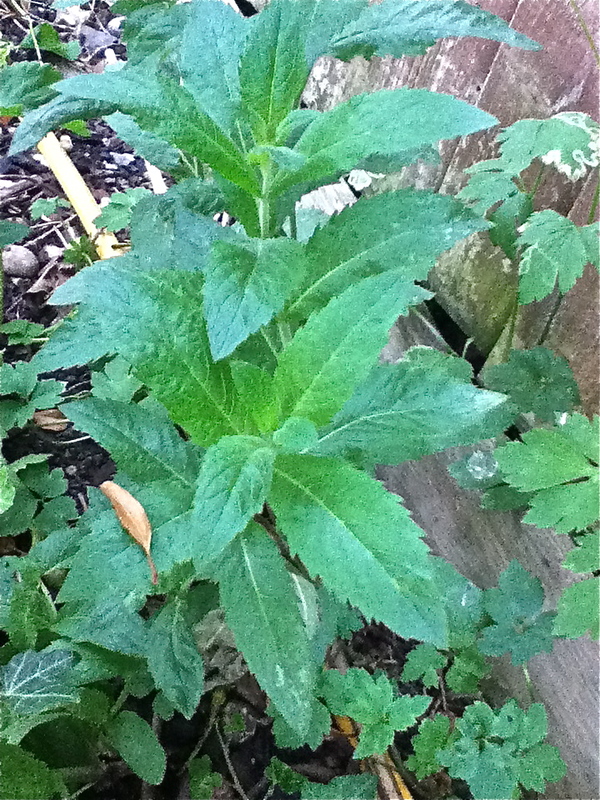 Dull but essential to remove any bacteria, yeasts or fungi. Otherwise the chutney will spoil and that would be a shame and a waste. Do NOT add cold food to hot jars, or hot food to cold jars otherwise the jar will shatter which is too dramatic. 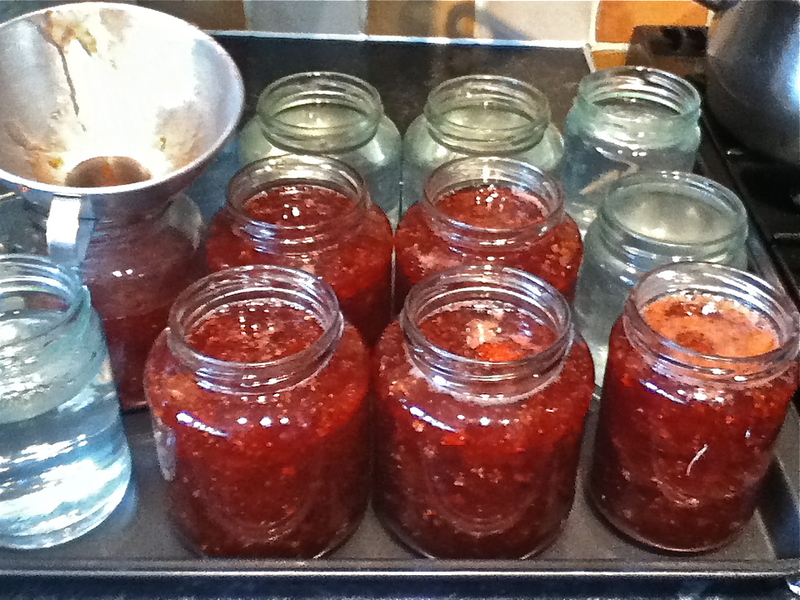 Give the jars and lids a good wash in hot soapy water and rinse. 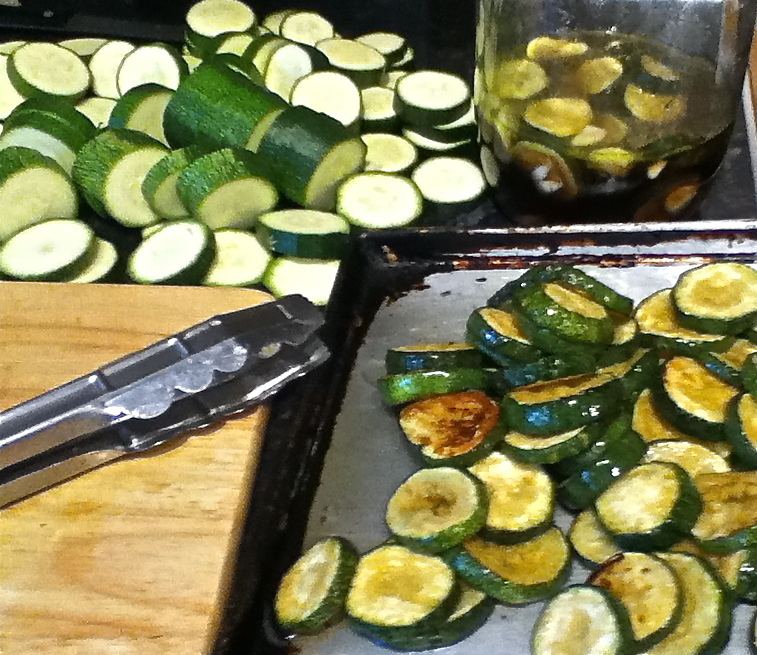 Arrange your jars on a baking sheet but do not let them touch. 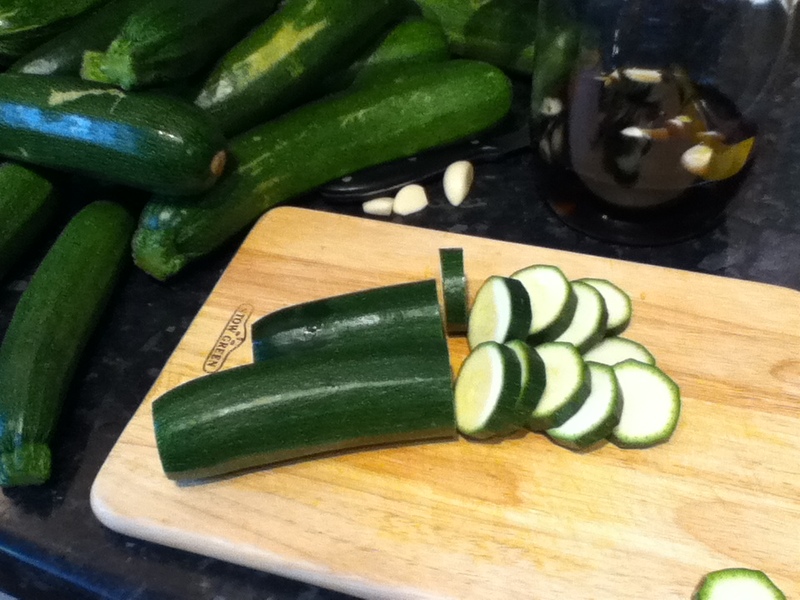 About 30 minutes before the chutney is done get back to the jars. Pop them into the oven. Turn the oven to 350°F/180°C/Gas 4 – no higher or the glass may crack or shatter. Close the oven door and leave for a 25 minutes. Set the tray of jars on a rack on the side. 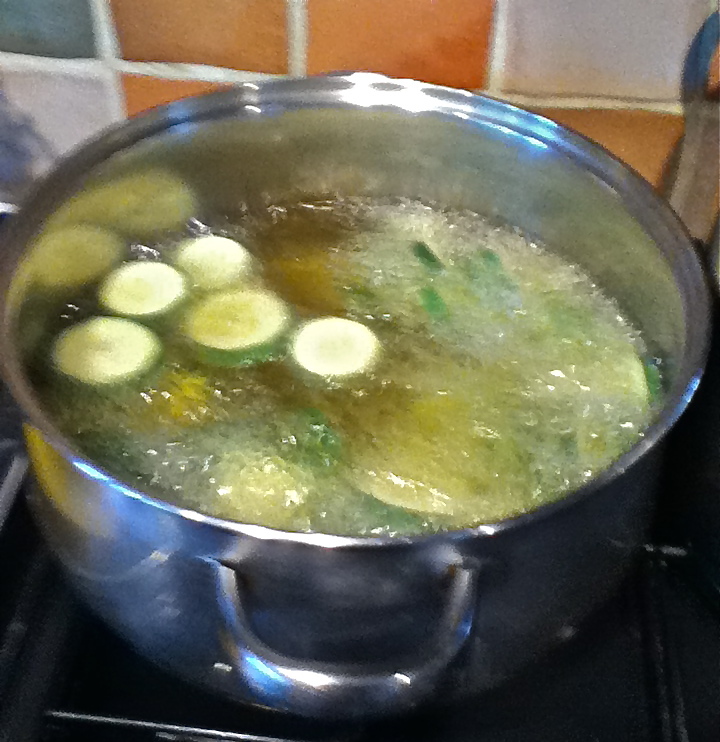 Turn the heat off from under the chutney and let it stop bubbling. 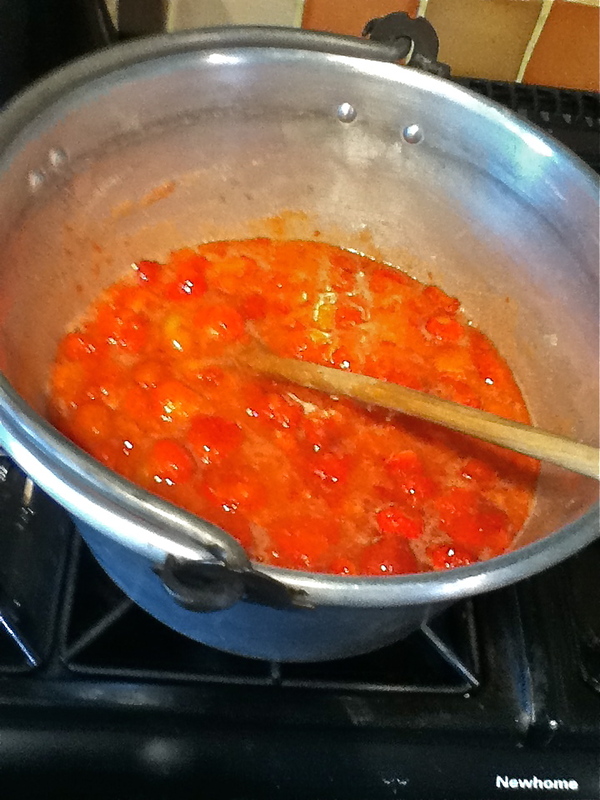 Fill the hot jars with the hot chutney, I recommend adding a ladle of chutney to each jar in turn before attempting to fill the jar completely, that way if one is going to ‘pop’ it can do so and you only have a spoon of chutney wasted. If you want to use the waxed disc now is the time to add them and then cover each jar with its own lid. NEVER add cold food to hot jars, or hot food to cold jars-otherwise you will have a drama! Leave chutney for about 10 minutes before tightening the screw tops on. Peel, core and chop the onion and pears. Stir carefully with a wooden spoon, turning it all over and letting the sugar have a chance to melt down before you start to boil it. Bring to the boil and give it one good stir. Reduce to a simmer and allow it to cook for 50 – 60 minutes, (this depends on your cooker) but you are wanting it to be thickened and dark looking. Ladle into hot, clean, sterilized jars, cover and seal. is a match made in heaven. I have made a Limited Edition Christmas Chutney. They will cost £5 per 500g/1lb jar.